The Seasonal Sounds Of The Singing Saw It's an instrument that sounds like Halloween — a ghostly whine from another dimension. But it doesn't take long to hear the familiar melodies of Christmas: "The First Noel," "Silent Night," even "Frosty the Snowman." 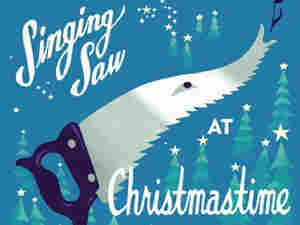 The music comes from an album called The Singing Saw at Christmastime. It's an instrument that sounds like Halloween — a ghostly whine from another dimension. But it doesn't take long to hear the familiar melodies of Christmas: "The First Noel," "Silent Night," even "Frosty the Snowman." The music comes from an album called The Singing Saw at Christmastime by Julian Koster, who normally plays stringed instruments in a band called The Music Tapes. Koster coaxes strange sounds out of his singing saw by bending it and sliding a bow against its smooth edge. Extracting a melody isn't as easy as it may seem. The songs celebrate a holiday season full of good cheer. But the saws that play them capture just a bit of bone-chilling terror — just right for these uncertain times.